Sad news, everyone. Bernard "Bunny" Behrens' son Mark wrote to me to let me know that Mr. Behrens (Uncle Gustav) has passed away. He had dementia and was very comfortable at the end. I found his obituary and a page in honor of his memory here. He was almost 86 and lived a long life doing what he loved, acting. If you haven't already seen it, Mr. Behrens sent me a wonderful letter back in 1998, which I published on Lucard's Home Page. He was kind enough to answer my questions about the show as well as "ramble on" (as he put it) extensively about his memories surrounding the series. 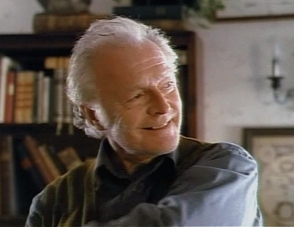 Gustav Helsing was written with Mr. Behrens in mind, and he had a lot of input into the character. Mark says his father "really loved that series and was very pleased with your site devoted to Dracula." To me, Mr. Behrens was a joy to watch, and Uncle Gustav will always be one of my favorite and most beloved characters ever. His eccentricity, warmth, humor, honor, and pathos grounded the series and were its heart. I'm sure many other fans feel the same. Bernard Behrens said it best himself: "The reason Gustav never destroyed Lucard, or he Gustav, was that Gustav would have nothing left in his life if he couldn't pester and pursue Lucard, and Lucard enjoyed the challenge that Gustav presented. They both wanted to continue playing the game." They will continue doing that forever in our memories and when we watch our recordings of Dracula: the Series. Rest in peace, Bernard Behrens, and thank you for all the happiness you have given to fans.